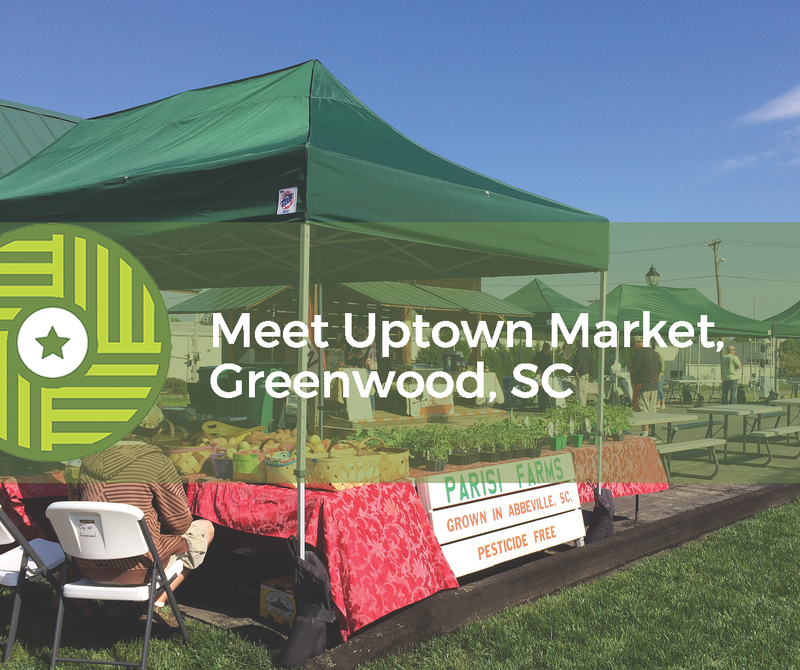 Over the next month, Uptown Market in Greenwood, SC, will be putting the finishing touches on their new farmers market pavilion. In the market’s sixth year of operation, the pavilion will feature drool worthy amenities and provide space for music and activities. They even have a ‘Splash Pad’ fountain area for the kids! As FMC’s next Guest Instagrammer, manager Stephanie Turner spoke with FMC about the Uptown Market. Farmers Market Coalition: Tell us a little bit about the history of Uptown. Stephanie Turner: Uptown Market has been in operation since 2011. The City of Greenwood began the market in two roadside stands provided by the SC Department of Commerce placed side by side on some property adjacent the railroad tracks deeded to the city by CSX. The market has 7-10 vendors and has a variety of products like produce, meats, eggs, cheese, prepared foods, art, soap and more. We have guidelines that require local products, and a farm inspection prior to participation. Artisans/crafters must have original work that is nature or garden themed. As the market grew, the entire community engaged in a visioning process to determine what the future of the market should look like. The City staff traveled to other markets and was really impressed with the market in Winter Garden, Florida. A similar facility became the goal for Uptown Market and funding was secured from the V. Kann Rasmussen Foundation, and local hospitality taxes to begin construction of a pavilion, plaza, landscape, interactive fountain, parking and more. The Self Family Foundation provided a grant to fund the salary of a full time market manager for 3 years. Farmers Market Coalition: What does Uptown have planned for 2016? Stephanie Turner: We are eager to move to our new home in Uptown Greenwood, which will be completed in March of 2016. The new, 160-foot pavilion will house 16-20 vendors and has been designed for easy drive-through access for the vendors to set up and unload. There are restroom facilities, a produce washing sink, and an ice machine all in the pavilion. We will install an edible plant landscape. Meanwhile, we continue to operate through the winter in the two stands. Stephanie Turner: In spring, when it warms up a bit, we will resume our “Fresh Connection” events each Wednesday. These special days at market include music, recipe tastings, free classes from the YMCA, Health Screenings from our local hospital and more. We have been very fortunate to have the support of our local hospital, Self Regional Healthcare. Their nutritionists select healthy recipes using seasonally appropriate vegetables to bring to market. Market patrons can taste the prepared dish and then take a copy of the recipe to try it out at home for themselves. A wonderful local restaurant has partnered with us to provide cooking demonstrations at market. We’ve also invited culinary students from our local career center to do a live demonstration at market. We plan to do much more with children’s activities this year. The interactive fountain (splash pad) will be bringing lots of young visitors to our market so we plan to incorporate educational activities and fun opportunities for children to try new vegetables. We’ve invited the YMCA summer camp to visit and enjoy some programming on healthy eating and some time in the fountain. Our Grand Opening for the new facility will be in April in conjunction with Uptown Greenwood’s concert series, Uptown Live. We held a design contest for the local school children to create art for our first market tote bag to be unveiled at the Grand Opening. We also partnered with the Arts Center to help them get a grant for a month-long celebration in August called Art and AgriCULTURE. Artists will be partnered with farmers to create works that celebrate our local agricultural heritage and vibrancy. During National Farmers Market week the artists will do demonstrations and displays at market, and the Arts Center will host activities for children. The month will wrap up with a Farm to Fork dinner at the Arts Center. Stephanie Turner: We promote the market any way we can think of! We rely on Facebook quite a bit, especially to give last minute notice of changes or cancellations, or to simply announce the products you can expect at market that day. We are on Twitter and Instagram as well. Some of the best engagement on social media has come from the ‘fun’ posts, for instance, when a child is visiting us dressed as batman. It’s always good to include those little glimpses of fun at the market. Our local newspaper and online news outlets are great resources. One news outlet even produces mini video sessions with relevant news about Uptown Greenwood and the market. The paper publishes our schedule and what to expect each week in their Taste section. The local university radio station as well as a local AM station have also been gracious to invite us to talk about the market. From time to time we’ll print a poster or flier about the market to distribute around town. One of the best opportunities to promote the market has come from invitations to speak at garden clubs, rotary groups and the like. Nothing is better than being able to share information in person like that.